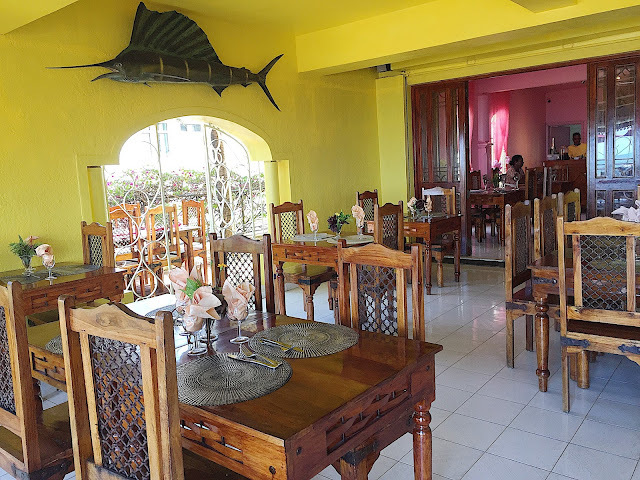 I have very fond memories of Les Copians d'Abord which is situated at Mahébourg, a small city on the south-eastern coast of the island of Mauritius. Mauritius is a beautiful island, with amazing beaches. To get around, you have the choice of taking the public bus, taxi, renting a car or booking a tour. If you are renting a car, it will be nice to take a road trip and stop by Mahebourg, have a fantastic lunch at Les Copains d'Abord. For a suggested road trip, you can check out my blog post here. Les Copains d'Abord means "Friends First" in French. 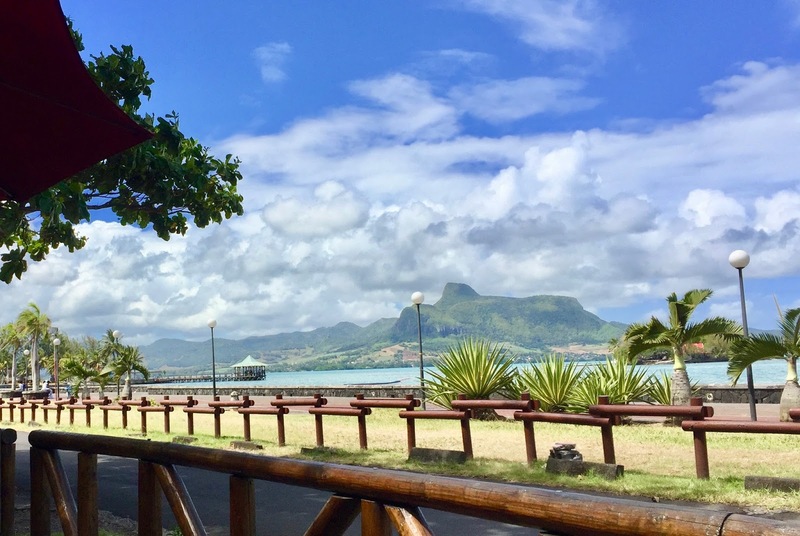 Although French make up of only a small fraction of the population, the history of French colonization has ensured that the French influence is still very much evident in the present day culture of Mauritius. French is the language used at the work place. Between friends, Mauritians will speak Creole. 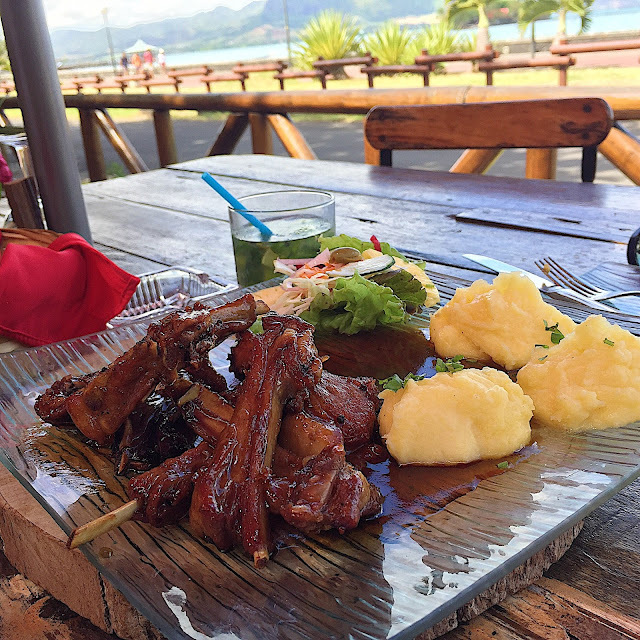 Mauritius cuisine is influenced by a a few cultures such as as mentioned, French, Indian, African and Chinese. 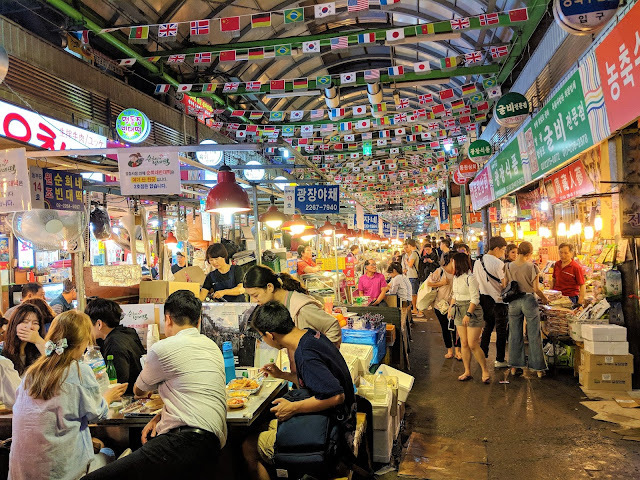 The local fare that most locals attest to are lentil soup, roti, smoked marlin, noodles, wild boar, curry squids and curry everything. Les Copains d'Abord is a great place to try because the food is first and foremost, delicious. The view is breathtaking as it is situated right beside a waterfront. I highly recommend the following dishes as they were very yummy. The curry in Mauritius is amazing. The spices are very unique and extremely fragrant. It is not easy to replicate the flavours back in Singapore. What is popular is dry curry. The squids were very fresh and they went very well with the dry curry and onions. My mouth is salivating right now at the thought of the curry squids. The exotic and deep flavours were a perfect compliment to the white rice. Yummy! It also came with some simple sides to cleanse the palette after a rich dish. Mauritians are very proud of their lentils soups and most of the local dishes are very healthy. Do you know that lentils boost metabolism and help the body to burn fats? It is a super food for weight loss. Check out about the health benefits here. The lentils soup was delicious. It reminded me of Chinese red bean soup without sugar and much more fragrant. 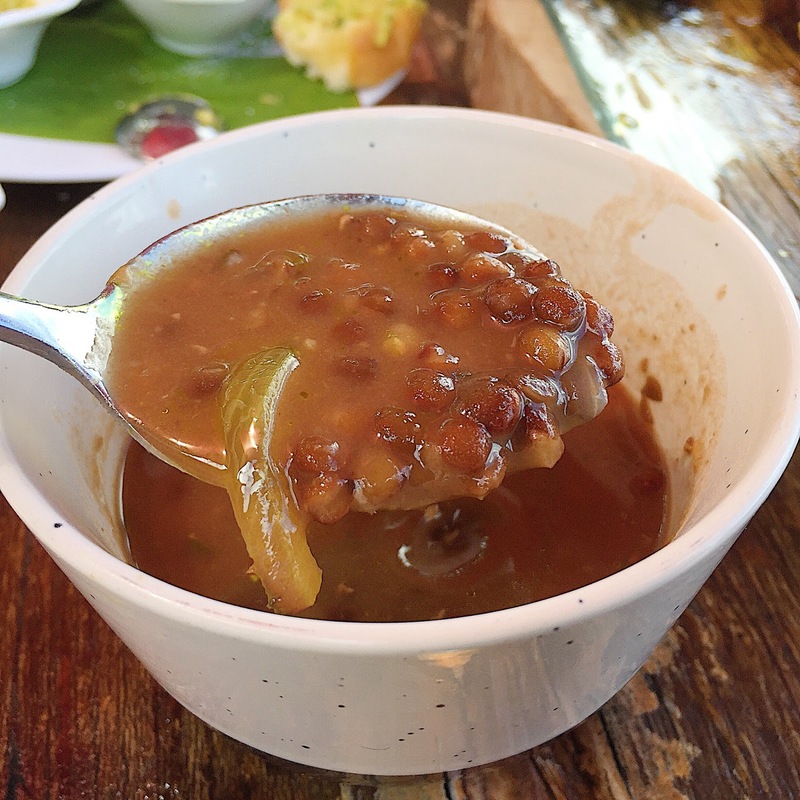 Make sure you try lentils soup before you leave Mauritius! Wild Boar is featured in many restaurants menus as it is influenced by the historic hunting habits of the French colonists. Wild Boar is also considered to be of a higher quality as compared to the farm pigs. The Wild Boar ribs at Les Copains d'Abord were the best ones I have ever eaten. They were so tender and juicy that I could not forget, The marination was also perfect, not overwhelming the sweetness of the fresh pork and yet complimenting it very well. Excellent! 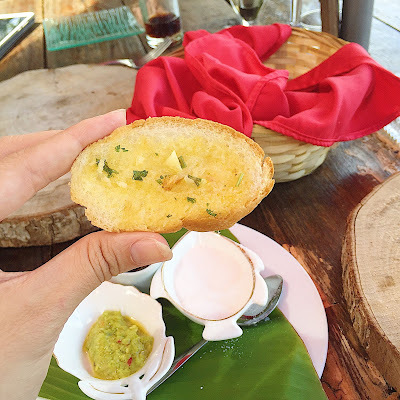 When I dined at restaurants, a basket of garlic bread would be served. The garlic bread were always beautifully done, crispy, buttery and garlicky. They were so delicious that I always had the temptation to pack some back to my apartment. 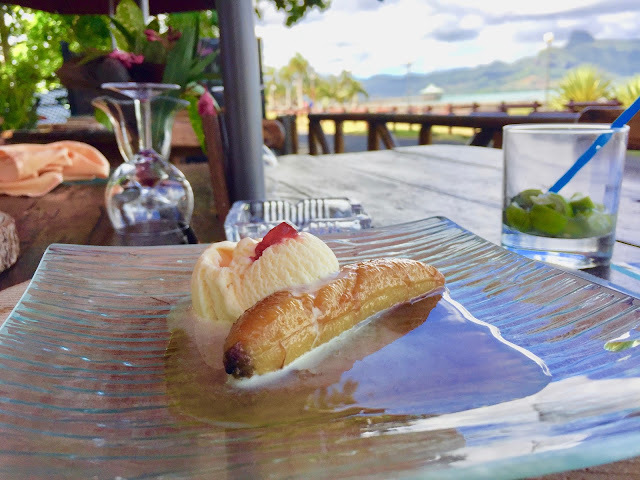 The Banana Flambe is a popular dessert in Mauritius. There are many sugarcane plantations in Mauritius and Mauritius produces good rum from sugercane. The Banana Flambe is always set on fire using rum. 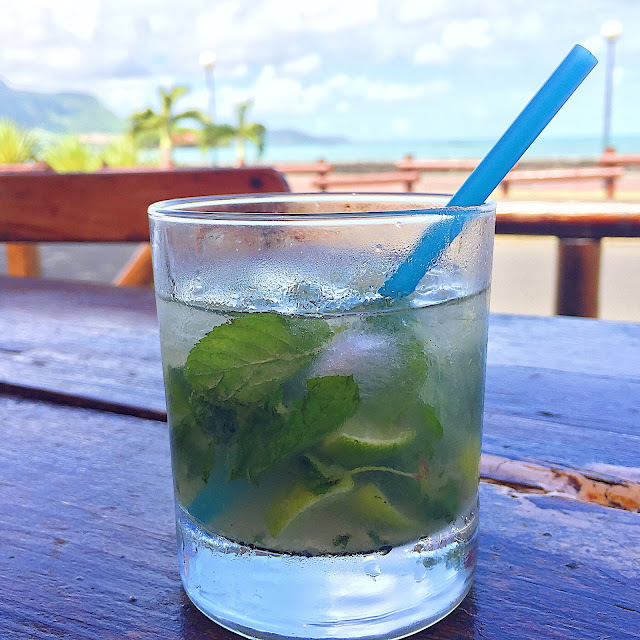 There are many different types of rum in Mauritius - orange, coconut, coffee etc. The Banana Flambe was very lovely, in terms of presentation as well as the taste. The rum was not overpowering and it added just enough alcoholic flavour to the dish. The only suggestion I have is for the restaurant to set the banana on fire in front of the diners which will add some theatrical effects. The restaurant had a variety of drinks on its menu. Usually, I would drink Phoenix, a local beer. I decided to try a refreshing Mojito instead. It was very strong. For those of you who want a refreshing and yet a strong sensation of alcohol down your throat, this drink is for you. Look at how beautiful the view is! I was very thankful to be able to dine at such a beautiful place. I could sit there and just enjoy the view for ages, sipping my drinks and tasting the delicious grub. If you are renting a car or if you are at Mahébourg, it is worth every effort to stop by and indulge in a travelicious experience.